If you carry a revolver as a back-up duty weapon or off-duty gun, you have a need for extra ammunition. In Revolver Reloads Speed Strips, we discussed speed strips for reloading a revolver. In this installment, let’s talk about speedloaders. As you remember, speed strips are flat plastic holders that grip up to six bullets and provide a small footprint in the pocket. Their advantage is a low-profile carry. The disadvantage is that they reload a revolver slowly. If you watch any competition shooting, such as IDPA or USPSA, you will see talented shooters in the revolver class quickly re-upping their guns with speed loaders. A speedloader is a bullet holder that is shaped much like the cylinder of your wheelgun. It orients the rounds so a full reload of the firearm is accomplished. With practice, the revolver can be reloaded very quickly. Smith & Wesson competition shooter Jerry Miculek set a world record in 1999, shooting two full cylinders from his six-shot revolver, with a reload in the middle, in under four seconds. His reload was timed at 1.62 seconds! There are two basic variations on using a speedloader. These descriptions are for a right-hand dominant shooter. The first method is to open the cylinder, holding the gun by the cylinder and frame in the support hand, and face the muzzle up. The dominant hand sharply smacks the ejector rod using force and gravity to dispel the empty casings. The support hand points the gun muzzle downward. 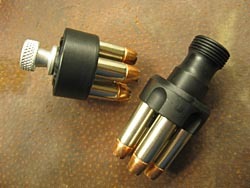 The dominant hand retrieves the speedloader, inserts the rounds and releases them, then closes the cylinder. The gun should be oriented toward the threat and is ready to fire. A second way to use a speedloader is to keep the gun in the dominant hand during the reload. Gravity or the index finger of the dominant hand holds the cylinder open and the process is much the same as the first method, only reversing hands. During either method, once the bullets are released into the cylinder, the speedloader is allowed to fall away as the cylinder closes. There is no reason to retain or pocket an empty speedloader. In the sunset days of police revolver carry in the late 1980’s, we were taught the first method of using the support hand to hold the gun during reload and the dominant hand doing the manipulation of the speedloader. The thought process here was that under stress an officer had a better chance of accomplishing a smooth and timely reload if he used his dominant hand to do the complicated movements with the speedloader. If you do some research and practice and practice, either method is fine. The upside to the speedloader is how quickly the revolver cylinder is fully reloaded, in capable hands. A downside is the bulkiness of a speedloader, if pocket-carried. Speedloads come in several variations, the importance of which is the way the bullets are released. This will be the focus of Part 3. Randall is a twenty-three year sworn police officer in a mid-sized Florida police department. He has been an FTO, K9 Handler, Detective and SWAT Team Leader. He is currently the Midnight Shift K9 Sergeant and department SWAT Coordinator.